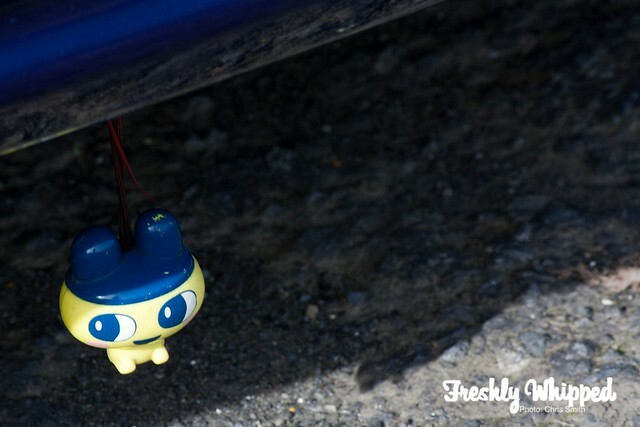 Pinoy Car Club is a club based around Filipino and their cars. I was invited out to shoot the meet and their drags. I headed out to Meremere around 11am to get started, met up with Gello and met the folks. The club itself can be seen with their neat stickers! Although this one seems to be missing a few letters..
Gello’s working on this little ZC EG Civic. He’s hoping to make it into a track car for meets like this. The EG platform is a great place to start. Many different cars showed up throughout the day. 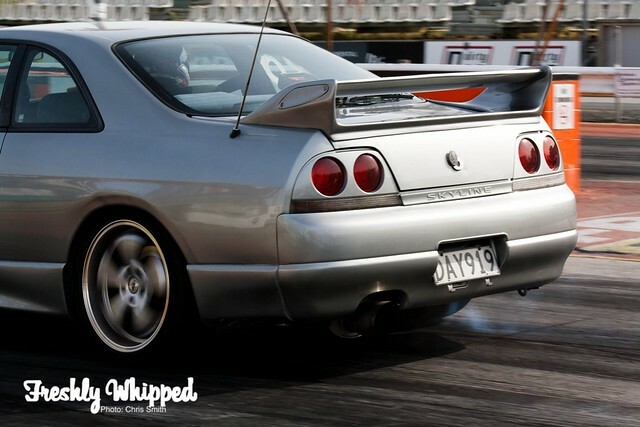 Such cars as this R34 GTR. 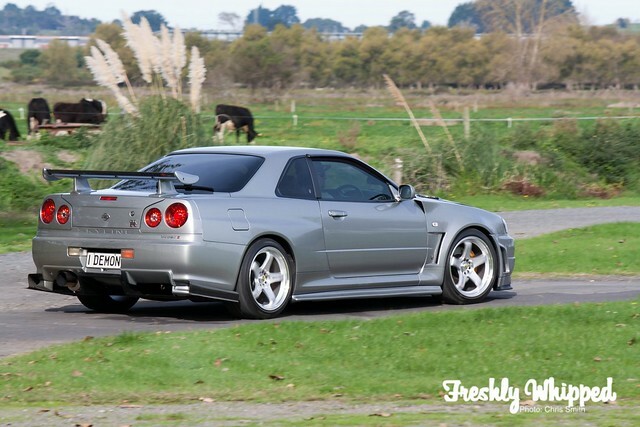 As you know, we at FW love R34 GTR’s and have featured one before. This one had a change of body kits and Nismo wheels added to it. 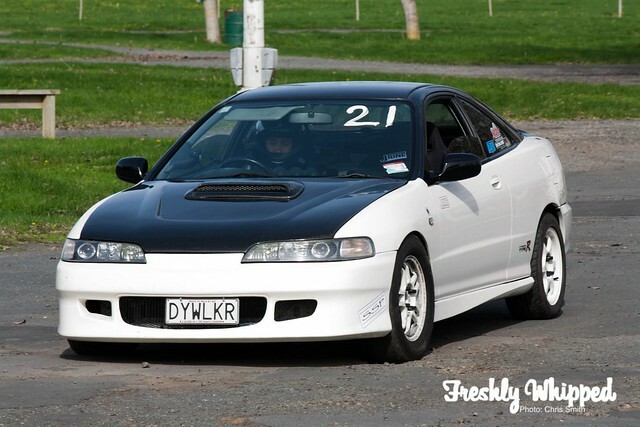 I like the subtle touch of a Holden GTR badge on the front, rather than the stock one. 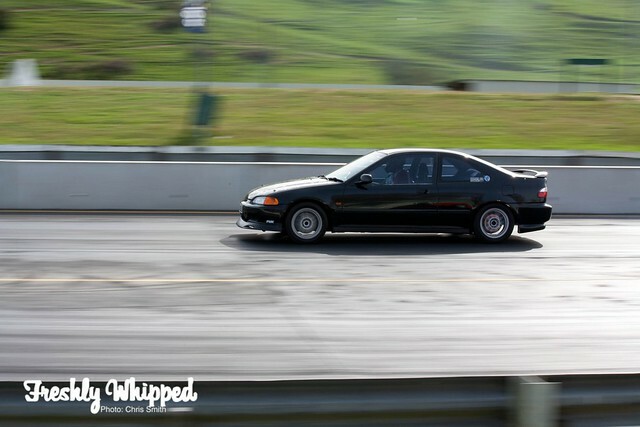 I love it when people complain and say that Hondas or any front wheel drive car can’t lay down some licorice. I think this is easily enough proof that they can. 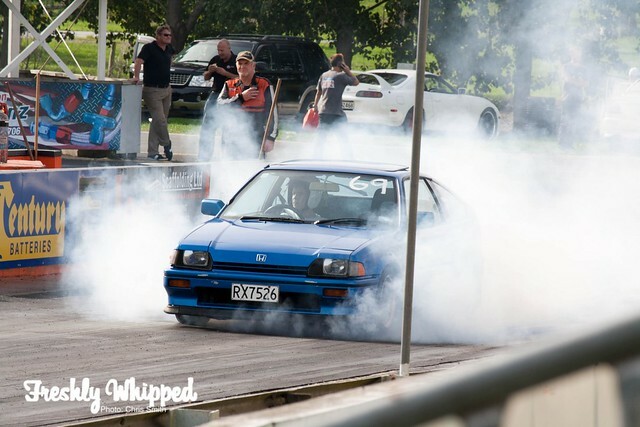 Our friend Davy had his Integra drag car out. This car was originally built by JTune as a drag car and now resides with Davy. He was running 13′s with it on the day. The car will soon be getting made into a street car full time. Some more recent cars also came out, such as this E63 Mercedes. The owner wasn’t scared of warming up the tyres either. Good to see these cars getting their potential brought out. 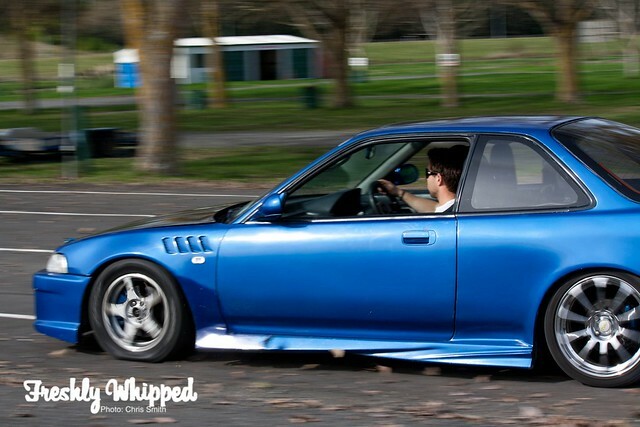 Cody was out in his S14 laying down some times. His S14 is currently stock besides a change in clutch. You can check out more of this car in previous posts. I really enjoy seeing cars like this out racing. Who says FW doesn’t have exotics? This E55 has a lovely 5.5L V8 under the hood. This and the E63 were running 13/14′s. I’m pretty sure they were stock too. Not bad for a 4 door family car..
I’m not sure if anyone else feels the same, but every time I see a Coupe Civic I think of the first Fast and Furious movie. Funnily enough this one was pretty similar to the ones in the movies, looks wise. 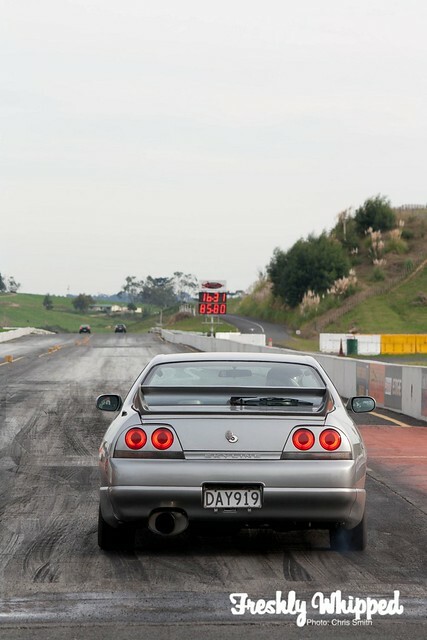 You’re meant to have fun in R33′s. Don’t deny it. These two looked lovely sitting next to each other. It’s nice to see clean cars at a track day. The wheels on the Supra are sick. There’s plenty of these Integra’s that are all show and no go. This one is all go however. Laying down a personal best of 11.98. That’s a very fast road car. This yellow Integra was looking mighty fine. The Honda yellow is a defining colour for the brand and surely goes well with this one. 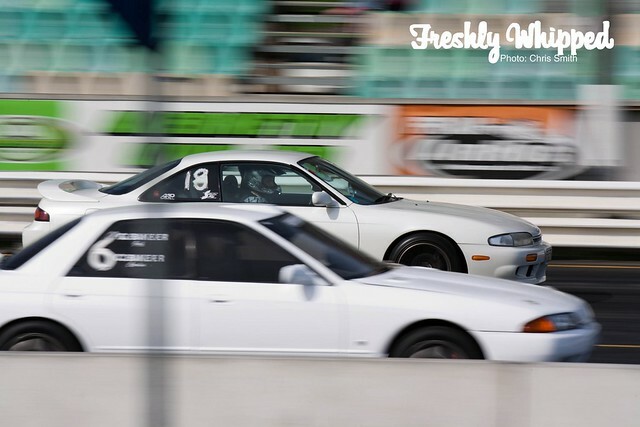 There was a few Skylines out on the day, with members from clubs such as Skylines Downunder, CJC, NZHondas and of course PCCNZ. 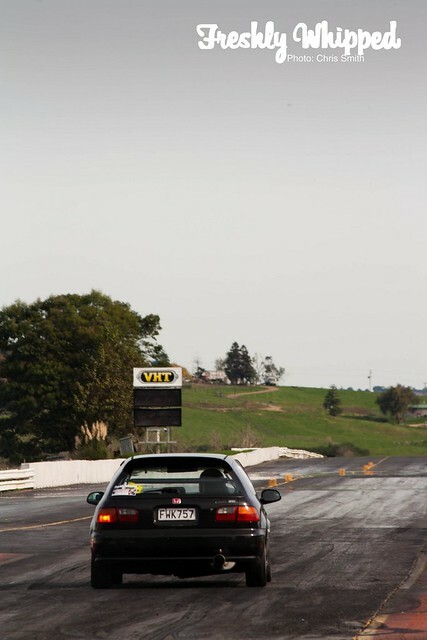 Meremere is a surprisingly good looking track. The surrounding trees make for great background. This lot was lining up to get onto the strip. 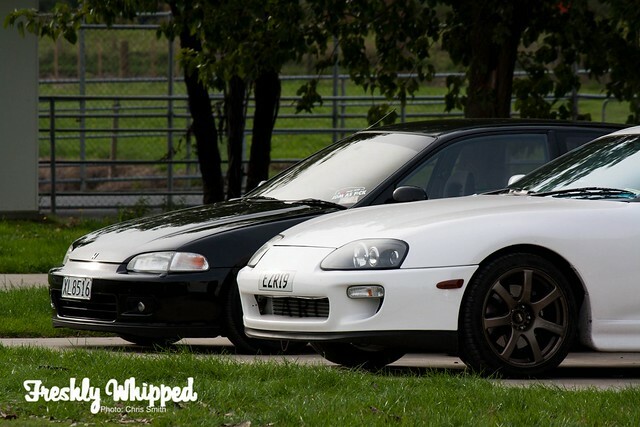 Euro and Japanese cars together. 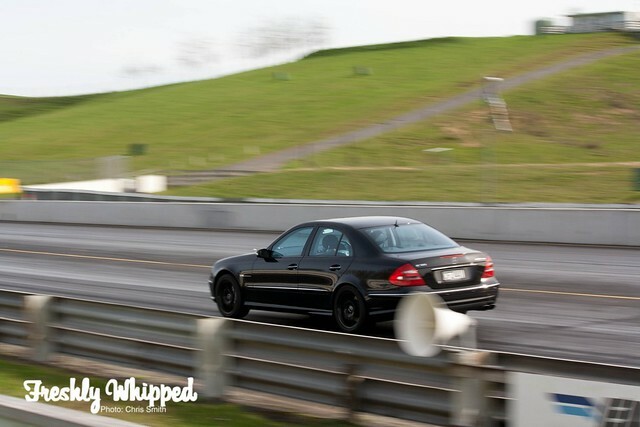 The E55 could lay down great times on track, then look stylish in the meantime. Not many cars pull that off. 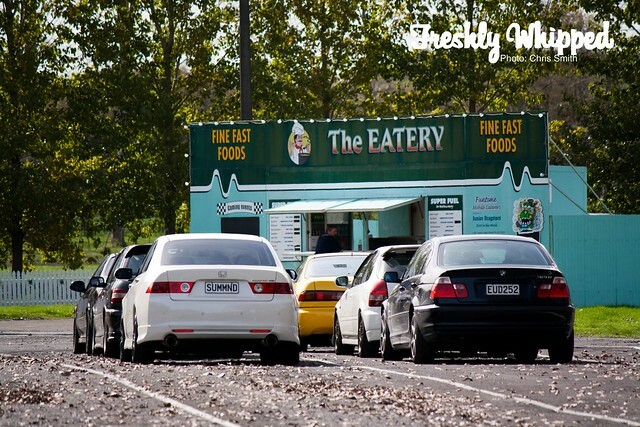 Was a nice day out, with surprisingly fine weather. As I headed off we chucked some stickers on some cars. White cars and black stickers! It’s awesome. As usual, there’s plenty more pics on our Facebook Page.